We are a local, family owned and independently operated pre-owned automotive dealership in Raleigh, North Carolina with over 30 years of experience in buying and selling quality vehicles. Over time we have developed a rarity in the used car business–a non-traditional philosophy of offering our local community a hassle free and better used vehicle buying experience. We offer a superior experience by utilizing convenient internet and mobile technologies and helpful, high-touch personal customer service with fair market prices. The Carfax reports, inspection sheets and service reports we provide free up worry about the safety and performance of buying a pre-owned vehicle. 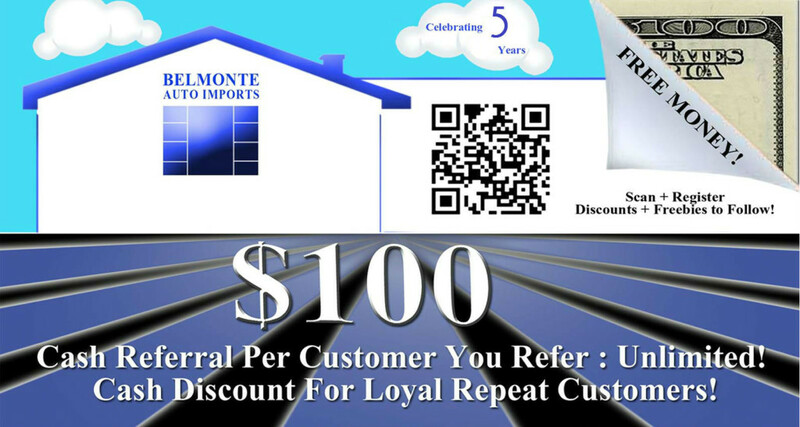 Belmonte Auto Imports never sells flood, salvage, or junk cars because we don’t buy them! Pre-sale inspection, NC state inspection and current service work are performed on every vehicle that leaves our dealership with our name on it. We partner with some of the best warranty companies to offer warranties on most vehicles. We are interested in developing long term relationships with our customers, so customer service is our top priority. We offer lifetime trade-in on all vehicles we sell. We specialize in pre-owned import cars, trucks, and sport utility vehicles and a larger part of our business is locating cars for people the our resources at auctions, dealerships, trade-in and more. We appreciate your business. Give Dan and Vince a call and let them make you a great deal!